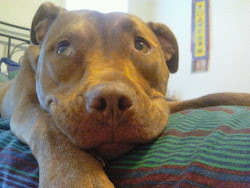 Peaceful dog: CGC Prep...with Prong Collars? 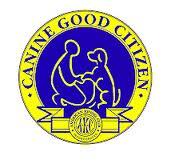 Having been certified recently as a Canine Good Citizen Evaluator, I wanted to watch a Canine Good Citizen prep class at a facility I've never been to just to see how other instructors work. My intention was to just observe, learn, and not to assist or co-teach and certainly not challenge the instructors or try to teach the class myself. I thought this should be no problem. I only have trouble keeping my mouth shut and observing when I deeply disagree with the training methods being taught, and this was a CGC prep class! I thought positive methods were guaranteed given the requirement that they be used on dogs taking the test. I guess the people running this class didn't bother to read up on the CGC test. Dogs were wearing choke collars and prong collars. Students were yanking their dogs' necks up and pushing their butts down to make them sit. One of the assistants had a gorgeous German shepherd who was being used as the demo dog. This dog had a prong collar tight around its occiput, and I saw this assistant yank down hard on the prong collar to make the dog go into a Down-Stay. She then left him in the down-stay for a long time, and when he got up to sniff, she yanked him back to his place with a loud No! The dog kept shaking its head at her. She was obviously clueless that the dog was telling her to chill out. I sat quietly through all of this and calmly held the dogs' leashes as they practiced their Supervised Separation task, though I'm sure I wore a horrified expression on my face. After all the dogs had practiced most of the tasks, the instructor asked me if I had noticed anything or had any feedback for the students. I said that they should know that they are not allowed to use prong collars or use physical corrections during the test itself. As a student of body language--human and canine--I noticed that the instructor looked away from me, ready to move on, as soon as I uttered these words. At the end, a student asked the instructor about her dog's pulling and the instructor tried to sell her a prong collar. The instructor actually said that she doesn't like the Easy-Walk harness because "Dogs don't learn not to pull" with it, whereas with the prong collar they do. Fortunately, I was able to dissuade the human from purchasing the collar and to talk to her about better ways to train loose leash walking. 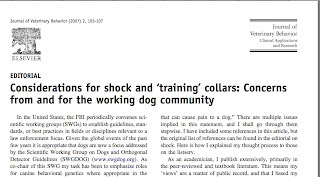 There are very good reasons for not using prong collars, some of which are outlined by Dr. Karen Overall in this paper. The American Veterinary Society on Animal Behavior's guidelines on punishment--which includes choke, prong, and shock collars--also discourage the use of these methods and types of equipment. Using an aversive method like a prong collar with sharp corrections just desensitizes a dog to pain, and does nothing to help him learn to work with his person. 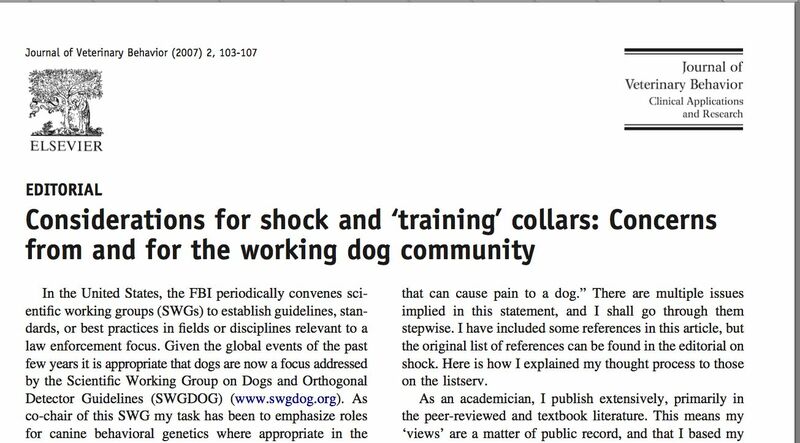 It pains me to think of that poor GSD shaking his head to no effect because his human is too obtuse to stop and see what she's doing to him--or to even read the guidelines for the thing she's representing to the public, which state clearly that prong collars and harsh physical corrections have no place in a Canine Good Citizen program. The Washington DC area has many wonderful dog trainers and I have been fortunate to apprentice and be surrounded by some of the most progressive and thoughtful. It is good to know one place to absolutely NOT refer humans or dogs for any training that is informed by the developments of the past two decades. Their humans need to remember that the dog could also choose to inflict pain on the human, but they don't. They understand more about respect and trust than their humans do. The thought of CGC class with prong collars creeps me out, too. I'm glad you turned around that one person's perspective-- hopefully this idea will spread. 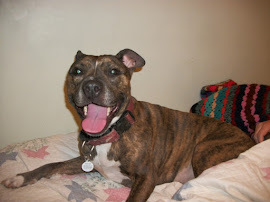 I think prong collars are on their way "out" whereas about 6 years ago they were everywhere. Don't you think? 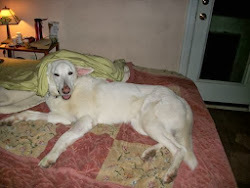 By the way, I saw your comment on Emily's blog about Ginger's adoption. 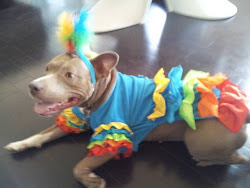 I would love to see Fozzie in a tutu! OMG I don't think I could have sat there with my mouth shut! God Bless you for your restraint and thank goodness you could talk that person out of a prong collar! Unfortunately the owner of the GSD was following the advice of a "professional" trainer. Sad isn't it? Sadly for me up until about a year ago I subscribed to these methods as well. I am currently trying to steer the streams of clicker trainer because I like the concept better. We need more PR trainers. Excellent post. Will be sharing so more folks can see. I know of someone I work with who knows I handle dogs...still went to seek out advice from someone else who recommended the prong collar and she was going to try it...all because the dog was jumping! I couldn't believe it. Ugh, that's awful. I would have had a really hard time stomaching that. We just completed our own Canine Good Neighbour (same as CGC, just Canadian) prep class this summer. Oddly, we took it after an attempt at the test. :-P But anyway, our class was so positive, so much about the comfort of the dogs and about setting them up for success that it pains me physically to hear this may not be everyone's experience. We graduated the class feeling good. 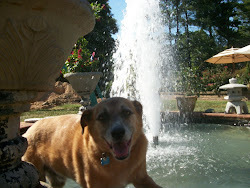 Our dog looked forward to going and to learning new things. We have a better relationship because of it. We might still fail the CGN if we take it again in the fall, but we gained so much in the class it doesn't matter. I am sickened by the thought others may have been turned off from training as a result of such a class. Proponents of prong collars always say "well it doesn't hurt the dog." Right. It is true that I don't see them that often out in the world. Hopefully that means the general population is getting a clue. Hopefully this instructor is nearing retirement age? The positive thing is that people care enough about their dogs that they're taking them to a training class and preparing for the CGC certification. It's so unfortunate they're getting such poor advice. Both the people and their dogs deserve better. We need to keep spreading the word. Hopefully the person you were able to talk to has learned something that will take her to a new relationship with her dog. Thanks Pamela :) I'm glad people are looking into CGC and taking classes...hopefully they'll look into it enough that they'll read the guidelines and raise questions with the instruction they've been given. The instructor was older, but the assistant with the troubling relationship with the GSD was a young woman! 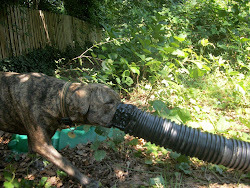 People use prong collars/shock collars/etc because they want instant results. They're out for short-term, not long-term. It took me a while to realize that even though it was going to take longer, positive reinforcement gave me a happier, better-adjusted dog in the long run. Unfortunately, I'm a lousy trainer, so he still does all sorts of stuff I'd rather he didn't... but he's happy and he trusts me. LS, you are so right. That is a really good way to look at it. And I love hearing what you say about your own dog. I feel the same way with my dogs...but I think I am just too close to them to be consistent enough with them for them to learn the things I want them to. I can just imagine the look you had on your face -- I swear I wear the same one nearly every time I go to a dog park or even to work sometimes and see these dogs CLEARLY telling whomever that they're stressing out due to tone of voice or human body language. Good for you, Ximena! I'm so glad to hear of others doing the important work of trying to translate for our dogs! http://badrap-blog.blogspot.com/2011/07/prong-collars.html In respect bad rap and I'mm ok with their use of prong collars see there to see why. Prong collar sometimes is all that works for a dog. I would never use them but if it is what works for the dog and handler and the dog is happy how can we deny them the tool that makes them such a great team?